One of the most cherished traditions at IHM School is the annual All Saints Day Celebration, where the Kindergarten students dress as a Saint and participate in All School Mass. 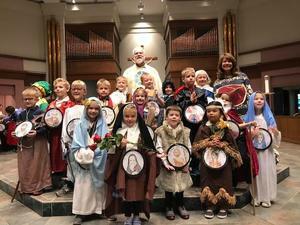 Each child attends Mass in costume, dressed to commemorate the life and work of their selected Saint. As the Cantor sings the name of each Saint, our students file into Mass and stand before the congregation as replicas of our heavenly brothers and sisters. IHM School is proud to share this time-honored tradition with our families and fellow parishioners on this Holy Day!